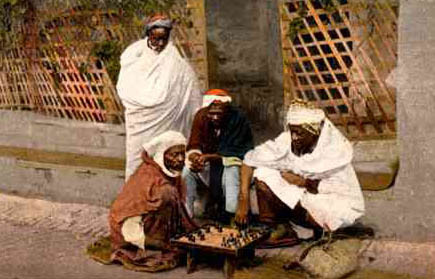 The undated postcard is loosely translated "Algers-Blacks playing chess." Of course, in French "échecs" does not necessarily refer to "chess," but could refer to other board games such a warri, ayò, or draughts. Pictured are four men playing what looks like a precursor to contemporary chess. However, the board men appear to be the same height, dark colored and positioned on alternating squares… likened to checkers or its precursor, "el-Quirkat." Perhaps the game being played was a variant of "Shatranj." More important is the point of these men showing utmost erudition at a board game requiring strategic execution. It is possible that the above picture was taken in pre-colonial Africa more than 150 years ago in the Northwest country of Algeria. In the picture, the man standing is dressed in a handsome robe and turban commonly worn by Moorish men. Notice the picture's similarities with this one. 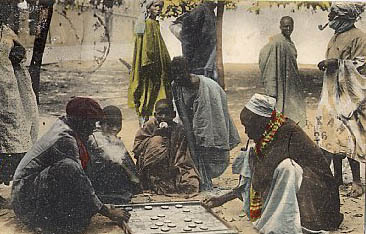 The Moors inhabited a swath of land stretching across the breadth of the Sahara and were adept blindfold players, problem composers and tournament competitors. This zeal for chess was brought to Europe in the 8th century and would serve as the forefather of the chess we know and love today. Also read, "The Black Genesis of Chess: Moors of Spain"
"For instance, it is common to find clusters of people playing African chess or European checkers under the shade of a big tree. In fact, checkers is one of the very few sports in which Senegalese really excel." Dr. Mbodj is making an implicit statement about Senegalese players such as GM Ndiaga Samb, but perhaps he's making reference to the widespread appeal of checkers as an ingrained part of Senegalese culture. Certainly many U.S. and European checker players in barber shops and park benches have arrogantly laid claim to "titles." It is only when they meet a player such as the ones pictured above do they realize that they are not as good as they have advertised. Alas! It is the same story in chess! Sulaiman Smith tells a story of a Senegalese named Mamadou who approached a group of checker players in College Park, Georgia (USA) and asked to play. After the men were completely outclassed by the Senegalese draughts maven, they couldn't believe he was so much better than them! Perhaps Mamadou got his start on the sandy streets of Dakar, Senegal watching older men play the venerable board sport as seen above.